Set to a score of iconic 80s hits such as “Man in the Mirror” and “Material Girl”, Back to the 80s transports the audience back to the year of 1985. Join seventeen-year-old Corey Palmer and the senior class of William Ocean High School as they face tests of love, friendship and popularity. This high-energy musical features everything from a classic 80s party scene to a Star Wars dream sequence – all rehearsed and produced in one weekend! Who doesn’t want to spend an entire weekend singing and dancing to 80s pop hits?! 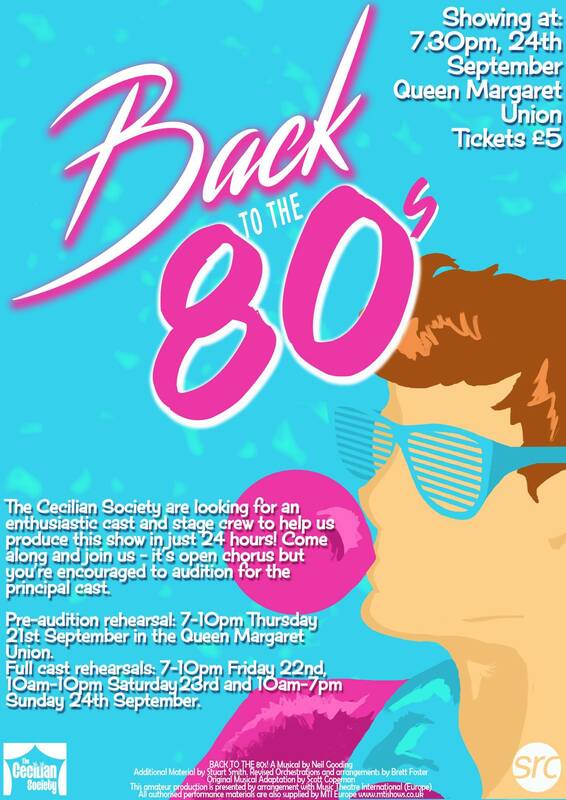 The Cecilian Society proudly presents: BACK TO THE 80s! A Musical by Neil Gooding Additional Material by Stuart Smith Revised Orchestrations and arrangements by Brett Foster Original Musical Adaptation by Scott Copeman This amateur production is presented by arrangement with Music Theatre International (Europe) All authorised performance materials are also supplied by MTI Europe www.mtishows.co.uk.